Learn Time Management Strategies To Rescue Yourself! 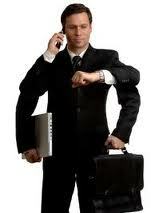 Home > > Time Management Learn Time Management Strategies To Rescue Yourself! Nearly 75% of my executive coaching clients say something like this at our first session: "I know we`re supposed to talk about leadership. But can you help me with time management? I`m drowning in emails, I`m in meetings all day, I don`t know when I`ll get it all done, and I`m falling further and further behind!" Unfortunately, many people in professional positions face similar situations. Statistics reveal that nearly 88% of people report having a hard time juggling work and life (1) and nearly 80% of medical expenditures are stress related (2). Wow! Clearly our normal time management methods are not working. Facing these tough situations, many people get motivated to change. . .but then revert to old habits. Or, we look for technology, a better boss, or a friend to help us out and rescue us. None of these seem to work. In light of that, I say "rescue yourself." Rescuing yourself means getting motivated to change and - most importantly - combining that with knowledge of time management methods and correctly practicing these to build good habits. In working with clients, I usually take them through a four step process. In the first step to rescue yourself, I recommend learning and mastering a few quick but powerful techniques to manage the onslaught of "stuff" coming at you. These time management exercises include email triage, calendar analysis and planning, to-do list management, dealing with interruptions, and learning to quickly boost your energy. Often, a few small but powerful techniques can give you room to breathe and help carve out time for more important things. With newly rescued time, I recommend assessing your situation to identify the patterns in your life that hurt you, as well as the patterns in your life (like your strengths) that help you. In addition, take some time to clearly identify and articulate your highest priorities. What are the things in your life you care about most? With clear priorities you can begin to build new habits that help support your priorities. These new habits include annual planning, weekly planning, daily planning, exercise, and learning to quickly shift from a state of stress to well-being. Just like muscles, the more you use and practice these habits correctly, the stronger they become. Once you`ve developed good habits, you can take all of your time management strategies to the next level. To do this, you can creatively invent ways to put your time management activities on auto-pilot. Examples of these time management resources include automatic bill pay, automatic financial transactions, automatic to-do lists, etc. In addition, with a bit of creativity you can come up with many quick systems and process that can dramatically reduce the amount of time you spend doing laundry, groceries, chores, preparing meals, shopping for presents, and many other parts of your life! Remember, the solution to your time management challenges is you! By channeling your motivation to learn the proper techniques and practice them consistently, you can dramatically change your life.